The Classic Victorian Tiling Company can match tiles to existing original flooring, recreate classic Victorian floor design, relay antique tiles or design brand new designs to suit your home. 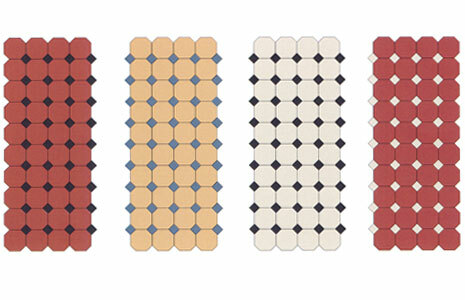 Take a look at a small range of tile design, colours and layouts as provided here by Olde English - geometric floor tiles, visit their website here. We can fit designs to any shape of floor, walkway or stairway. 14 images in total care of Olde English tiles.